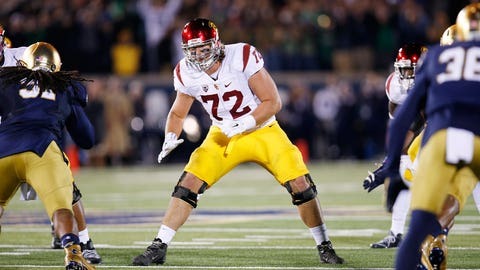 USC offensive tackle Chad Wheeler was in protective custody for a psychiatric evaluation Saturday after an altercation with police, according to a report by NBC News. Wheeler, a starting offensive lineman for the Trojans, missed Saturday’s practice for a "personal issue," head coach Clay Helton told reporters earlier in the day. Los Angeles officers responded to a man at around 8:45 a.m. PT (11:45 a.m. ET) who was possibly under the influence of drugs or alcohol, punching walls and windows, and injuring his hands inside an apartment in South Los Angeles near the USC campus, said the law enforcement sources close to the investigation. The man was identified as Chad Wheeler, a junior and an offensive lineman at USC. He ran out of the apartment after hitting at the walls and windows, the sources said. The sources did not go into detail about the exact nature of what led police to use bean bag rounds, a less lethal form of force. Both reports state that Wheeler was not arrested. NBC reported Saturday the he was taken to the hospital for a psychiatric evaluation and was in protective custody. LAPD confirmed that Chad Wheeler was not arrested this morning…therefore, per policy, would not comment about NBC report of incident. USC is set to take on Wisconsin in the Holiday Bowl on Dec. 30.